Marthe Jocelyn is the author-illustrator of more than twenty-five books! She writes and illustrates picture books and is the author of chapter books, young adult and middle grade fiction, non-fiction, and historical fiction. 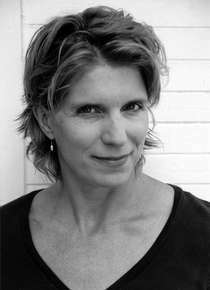 In 2005, she won the first annual TD Canadian Children’s Literature Award for Mable Riley. She lives in Toronto. Gigi Amateau: I wish I had known about sneaky art when I was a girl. And, I would have LOVED this book when my daughter was young. So many positive, creative projects! Did you ever do any sneaky art when you were a kid? Marthe Jocelyn: I loved doing April Fool’s tricks and I was big on making art in snowbanks or on the beach. The crafty part came later. GA: When you were making the book, how did you decide which art projects to include? MJ: I started with about 60 projects and there were different reasons for cutting them along the way. In some cases, the instructions felt laborious and would take up too much space. In other cases, the project might be simple and funny but there was no way to take a photograph that would highlight the craft AND show it off in context. GA: What if someone [not saying me, of course] isn’t all that crafty? Do you have to be an artist or a crafty person to be good at sneaky art? MJ: Short answer: You only have to be sneaky. Longer answer: There are projects in this book that require zero skill, that are likely not really “crafty” at all – like putting baby socks on the bottom of chair legs, or wrapping a red pipe cleaner around a gray tree branch. Most of the projects assume that you can use scissors and/or glue in a VERY basic way. The level of craftsmanship really depends on the person making the art – and the real artistry is concerned with where you put your finished masterpiece – who you surprise – than with mastering any kind of tricky technique. GA: It’s so exciting that your readers are beginning to send you photos of their “sneaks.” Where may folks send you new ideas or pictures of their sneaky art projects? MJ: The sneaky art studio is humming with new ideas every day. We love how sneaky artists far and wide are adding to our collection! Take a sneaky peek at the website! MJ: I’m just finishing a collaborative project – a middle grade adventure fantasy called Viminy Crowe’s Comic Book. I’m working with another Canadian author named Richard Scrimger and a comic artist named Claudia Davila. Most of the story is told in text but because it’s about two kids who find themselves inside a comic book along with all the heroes and villains, there are graphic sequences that carry the plot some of the way as well.